If you're a fan of cookbooks with photographs of every recipes, then Gooseberry Patch's 101 Recipes series is the series for you. Each recipe has a beautiful full-color photo of the mouth-watering dish. Not only can you see the finished product, you can almost taste it. One of the definitions of hearty is heartfelt. 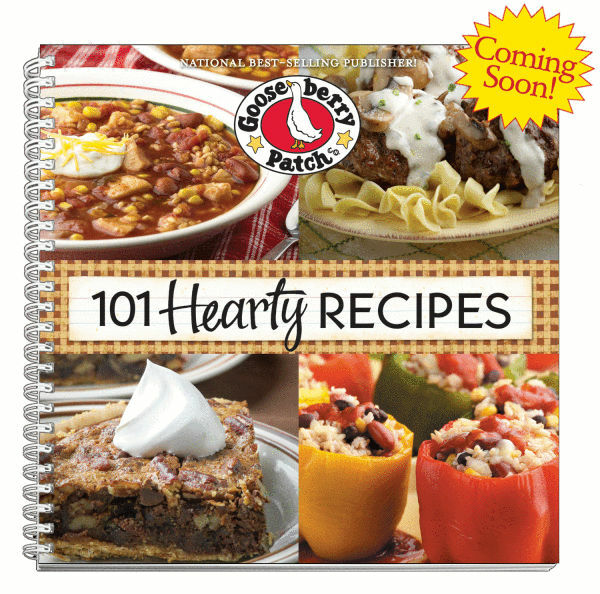 And, Gooseberry Patch's 101 Hearty Recipes is full of heartfelt recipes. The recipes are simple and comforting and I could imagine any number of these dishes on my own kitchen table. Although this cookbook isn't necessarily designated as a "fall" cookbooks, there is a feeling of warmth that comes from the recipes that makes me think of my favorite fall dishes. There are several dishes that are perfect for football season and tailgating: Deluxe Cocktail Sausages, Nacho Chicken Dip, and the Tailgate Sandwich Ring. Autumn is when I step away from the grill and warm up the kitchen with dishes such as Brown Sugar Barbecue Sandwiches, Bowties & Blush, and Farmhouse Chicken Bake. Don't worry - this really is a seasonless cookbook full of salads, beverages, and desserts. Do you really need to look at the calendar to know you're craving Shoo Fly Pie, Frosted Cherry Drops, or Brown Sugar Puddin' Pies? I didn't think so. ﻿I am so fortunate to have been asked to review Gooseberry Patch's 101 Hearty Recipes and want to share my good fortune with you. Gooseberry Patch has sent me an extra copy to give away to one of my readers. Kim, the Pecan Pie Muffins look so good, I'd like to have one NOW! i am already a follower and would love a chance to win. I would love to get this cookbook! I have noticed how often you refer to it and make their recipes, that my curiosity is peaked...... I do not have tons of cookbooks (in fact, I just gave some oldies away...) but I do have my favorite ones by my bed, on the coffee table, on the kitchen counter, and in a stack on the mantle.... One more? :) Enjoy your weekend! I'm already a follower and I'd love to have this cookbook. Thank you for the chance. Hi, Kim! I'm following you now on GFC. I am a follower, and I LOVE Gooseberry Patch! 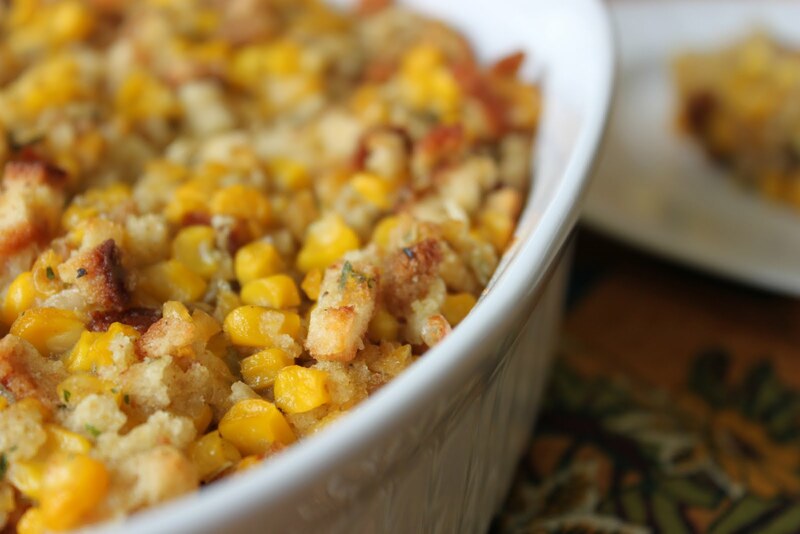 The Stuffed Corn Bake looks like something I'd love to serve at our church's Wednesday night dinners. I follow on GFC. Cookbook looks great! I found your site through my beloved friend, Lark @ Lark's Country Heart. Oh, I am so glad I did - love your site and all your amazing recipes with stories. I am following you now as well. I am looking forward to your next linky party so I can join in the fun. Have a great weekend and please stop by Concettas' Cafe for a visit. If I win this the first thing I will make will probably be that chocolate pie looking dessert on the cover! Thanks for offering this giveaway! I follow you on Google Connect. I have wanted a Gooseberry Patch cookbook for the longest time. This is a wonderful opportunity. I'm a follower and never miss a post. LOVE, LOVE, LOVE your blog and equally LOVE Gooseberry Patch. I'm a follower on GFC and I love the Gooseberry Patch cookbooks. I'd love to add this one to my collection, the recipes you made look delicious! I am already a follower and would love a chance to win this. Thank you. I would love to win one!! My email is volleyball13@hotmail.com! Those muffins sound soooo good! BU\ut I was looking for a fry recipe so I will surely be attacking that one soon too! I love Gooseberry Patch and would to win this one. Yummmm. Which recipe to try first, that is the question! I think Cajun fries to go w/the America's Got Talent Party at our house tomorrow. For that night, they can be called "Piercced Potatoes". I would love to win this cookbook...and I will follow you too!! oops...I forgot to leave my email address.. I would love to win this great cookbook. The recipes look so good that it is tempting me to dive in and start preparing recipes for my great and deserving family. I love cookbooks and I always use them to make my family well deserved meals, snacks and deserts!!!!! I follow with Google Friend Connect. Would love to win the cookbook. I would love to win a cookbook! And these looked like great recipes! I am now following your blog! I signed up on the network blog as a follower. I hope I did it right.. The picture of me on the blog I was 16 yrs..Now I'm retired.. How time fly's. I would love to win this cookbook. I have several of GP books from the 90's and have started collecting newer ones. I enjoy reading them and trying out new ways in preparing a recipe.. I love all the Gooseberry Patch recipes I have made. My daughter and I love cooking them together. We would love a chance to win the new cookbook. I would love to win this cookbook. I also love your blog, your recipes are wonderful and so tasty! I already follow you through Google Friend Connect. I would LOVE to have this book to add to my much-loved Gooseberry Patch Book collection! I signed up! I hope I win this book. It looks like the perfect book for me to add to my Gooseberry collection! Thank you for this chance to enter and win a GBP cookbook... I love the 101 Recipe Series!! Thanks so much, I will be following your blog! I am following you and I would love to win the GBP cookbook! I love their cookbooks!! I am a follower and would love to win! 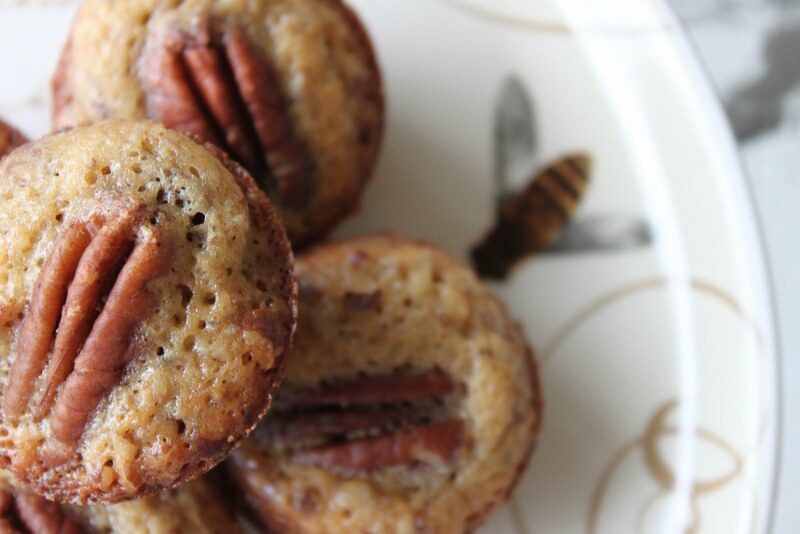 Cannot wait to try the pecan pie muffins over the weekend. Love Gooseberry Patch Cookbooks, I've collected them for years. They just make me want to cook! I'm you newest follower and just added a recipe to your blog party. Have a great weekend. I love Gooseberry Patch and have many of their cookbooks. I love all the wonderful things you post, and have followed for a while. Following through Google Friends and cant WAIT to try out the recipes in Goosebeery Patch!! I came across some of your recipes that were posted on Pinterest which led me to your blog. I know I will enjoy reading your blog because two of the recipes your posted recently are ones I have already made. I am a visual person. I need the pictures when I bake/cook. Love the website. Your blog sounds yummy!! I love Gooseberry Patch! I'm definitely interested in the cookbook! Thanks. Please enter me too! I hope I'm not too late! I'm a disabled Nana and love following blogs. Of ladies out there that are just like me. My granddaughter and I love to cook and do crafts. Those winter months are so hard on me, I can't get out so the blogs are just like talking to all my friends everyday! Thanks ladies! Love new recipes. Enjoy when they have pictures. Would be nice to have. Just Love Gooseberry~! They are the best ever!! So would love to win this book~ Thank you~! I am so happy to be here & love the looks of the new cookbook. I am an avid cookbook reader & collector. I am always making something & the idea of the Southern theme is Awesome!! 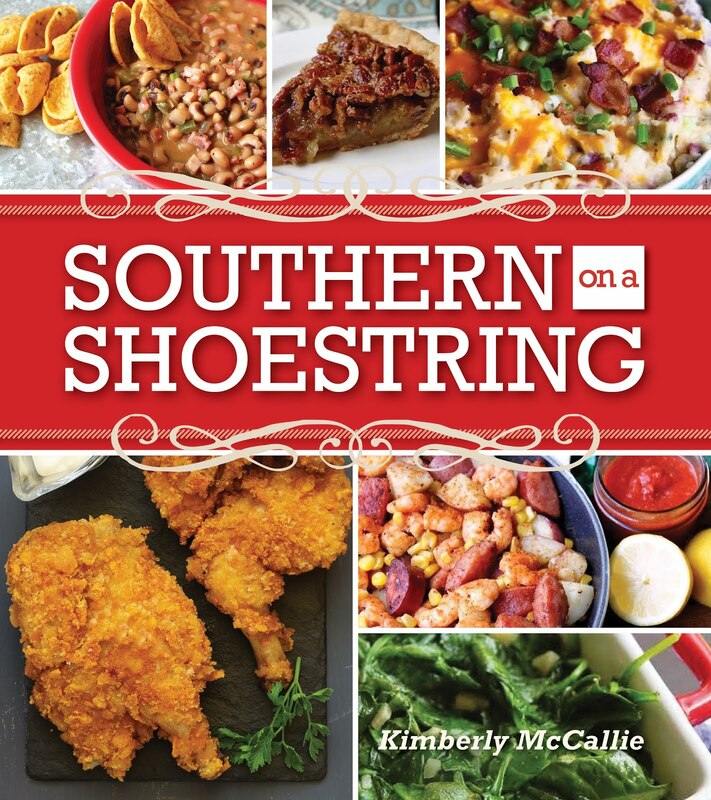 I love Southern food & am very excited about this book!! I would LOVE to win this new book! Thanks for the chance. I signed up to follow and I'd love to win a copy of the cookbook. Gooseberry Patch is my favorite! OOOOHHHHH would LOVE LOVE LOVE another one of your cookbooks to add to my growing collection! Would love to add this to the rest of my most favorite cookbooks gooseberry patch! !!! 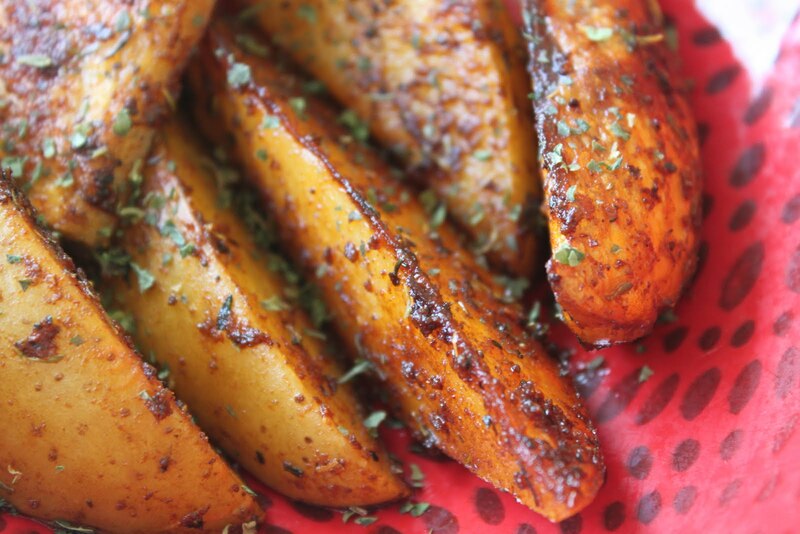 Mmmmmm, my mouth is watering for the Cajun Fries! My name is Laure & I'm from France. I looove your recipes that I've discovered via Gooseberry Patch website. I love cooking and I'm always trying to find new ideas so I'll be so happy to participate to this contest ! I am interested in winning the book. I follow through GFC and would love to win a cookbook - you can never have too many!! I love cooking & collect cookbooks. Would love a copy of this cookbook!! I'm already a follower and would love a chance to win this cookbook. Love the GBP cookbooks! I'm following you on Facebook! Thanks for the opportunity to win! I'm already a proud follower of your fabulous blog! (brownie points? haha just kidding) I would love this cookbook! This would be a fun cookbook I think - I love gooseberry patch!